The Real Jobs Deficit | Moving in the wrong direction. A total of 3,514,000 Nonfarm jobs had already been lost by the time President Bush handed the keys over to Barack Obama, yet even though the Great Recession officially ended in June of 2009, an additional 4,889,000 jobs were lost during Obama’s first 11 months in office (see table). By November of 2009 the recession had eliminated an estimated 8,403,000 jobs. It was at this point that Nobel Prize Winning Economist Paul Krugman set forth a reasonable benchmark for a return to more or less full employment within 5 years. According to Mr. Krugman’s theory, in order to keep up with population growth and recover the number of jobs lost would have required the creation of 300,000 jobs per month, through December of 2014. But, as I pointed out in Obama Jobs Scorecard – Part 3, today we find ourselves more than 5.4 million jobs short of this mark. 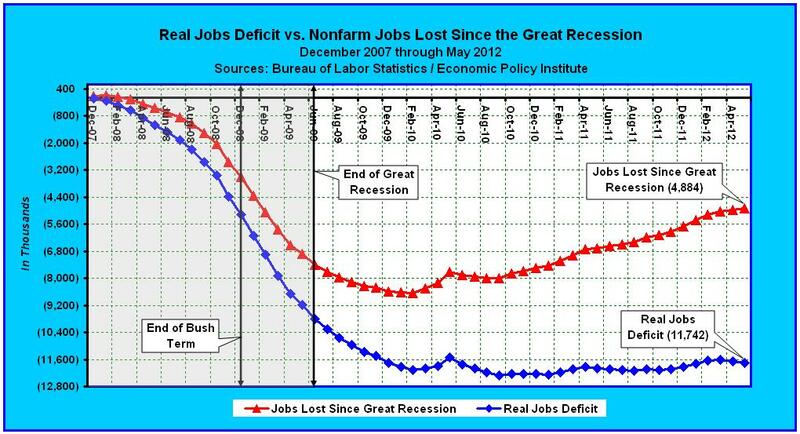 However, the real jobs deficit is even more dire. If we return to December of 2007, the month the recession began, and apply the Economic Policy Institute’s estimate — that we need to create a minimum of 127,000 jobs each and every month to keep up with population growth — we find that the real jobs deficit, since the recession began, is currently 11,742,000 (see table). As you can see graphically in the chart below, the jobs deficit hasn’t changed much since Paul Krugman set the benchmark at 300,000 jobs a month. Since then, as shown in the corresponding table, the jobs deficit hasn’t decreased at all, but has rather increased by 291,000. Last month, according to the Bureau of Labor Statistics, the U.S. economy created a mere 69,000 jobs (only 77,000 in the month prior). Since we need to create 127,000 a month just to keep pace with population growth that means lately we’ve been falling even farther behind. In fact, at last month’s rate, the U.S. will find itself another 3,190,000 jobs in arrears after another 4 ½ years of Obama’s economic policies [(127,000 – 69,000) * 55 months]. So we need to keep a close eye on the next official Employment Situation Report, and each subsequent report through Election Day. Anything short of a 127,000 increase in Nonfarm payroll jobs adds to the current jobs deficit, while a greater result means we’re at least moving in the right direction. In order to keep up with population growth, we would need to create 127,000 jobs times 31 months, or 3,937,000. Add in the need to make up for lost ground and we’re at around 15,679,000 (3,937,000 + 11,742,000) over the next 31 months — or 505,774 jobs a month. In order to keep up with population growth, we would need to create 127,000 jobs times 60 months, or 7,620,000. Add in the need to make up for lost ground and we’re at around 19,362,000 (7,620,000 + 11,742,000) over the next 60 months — or 322,700 jobs a month. In other words, we are worse off today than we were 2 ½ years ago. Every month that we create 506,000 jobs or more puts us on track towards full employment within 2 ½ years. Every month we create 320,000 jobs puts us on track towards full employment within 5 years. But every month we create fewer than 127,000 jobs increases the jobs deficit and pushes the goal of full employment farther away. The Bottom Line: Due to the Great Recession, we already had a jobs deficit of 5,165,000 when Barack Obama was sworn into office, but since then the deficit has increased by an additional 6,577,000 (see table). In other words, we’re NOT moving in the right direction, no matter what Barack Obama says. 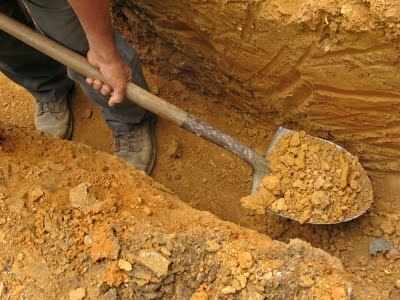 So who’s going to get us out of this ditch — the same guy who just dug a hole twice as deep as the one we were already in — or someone else?